Names submitted by Samantha Miley, history submitted by Tamara Kincaide. Pictures submitted by Neil Chase. The early pioneers of necessity buried their dead along the trails as they came west to seek their fame and fortunes and as they acquired land of their own and settled down the dead were placed to rest in burial grounds on family property. As the years went by and more families settled in the town and villages this practice became impractical and town cemeteries were laid out to accommodate the need. 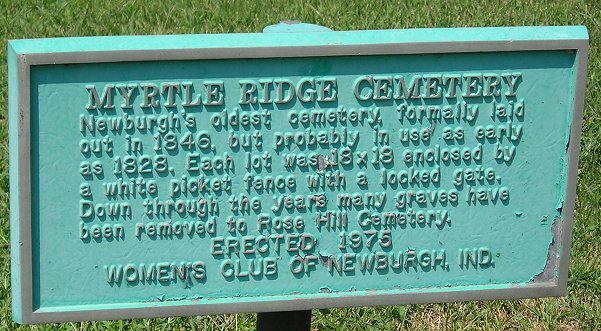 Myrtle Ridge was the first formally laid out cemetery in the town of Newburgh. The lots were 18x18 feet and enclosed by white picket fences which were locked and as there was no sexton the owners and survivors cared for the lots themselves. ELDORA MINER RALEIGH states that the first formally laid out cemetery was begun in 1846 but stones in the cemetery do not bear this out there are some with much earlier, possibly as early as 1828. Whether they were buried in some other places and reinterred at Myrtle Ridge is not known and no early records of the cemetery have been found. Bullett, G. W. Capt. Co H 12th KY Cav. Dennison, Lewis Apr 5, 1813 at Bellows Fall NH - Mar 27, 1864 in Newburgh far away from his childhood home. Edmonson, Thirzah died Nov 12, 1849 age 23 yrs, wife of REV J.C. Miner, Aurelia Udora H. Apr 10, 1855-Aug 4, 1856, dau of L. M. & M. S.
Miner, Eldora no dates, dau of L. M. & M. S.
Mobley, Richard D. stone is unreadable, 4th KY Inf., Co. E, Enemies in war but in the end buried within hailing distance of each other. Morrison, Nancy died Jun 6, 1848 27y 8m 6d, wife of E.
Ridley, This is all the stone reads. South, William Co. F 60th IN Inf. Also lie here are the REEDS, BALDWINS, MINERS, PEPMILLERS, FOSTERS, HOUGHLANDS, BRENNERS, STOUTS, NOELS, MCMURTRY�S, GRAYS, as well as many others. One of the last known buried here was WIRTY JOSEPH in OCT 1932. As the town grew a larger cemetery was laid out now known as Rose Hill and many of the early dead were moved there. Tombstones not Found in 9/2002 are listed below- Some of these missing graves could be ones that were moved to Rose Hill Cemetery. Hutchinson, ??? d. 4-25-1861 28y 21d w/o John T.